Kevin Owens, mostly shaved and in a suit, heads to the ring. Owens welcomes everyone to the brand new Kevin Owens show. The crowd is happy to see him, but Owens turns them around by saying that Canada is better than the United States. Canada also has better athletes. He then speaks in French and issues an open challenge to the SmackDown locker room as the new face of America. Baron Corbin comes out and heads to the ring. Corbin tells Owens that he can’t beat him up. It’s a fact considering Corbin beat Ambrose last week, and Ambrose beat Owens last night. Corbin also says that he’s owed a title match, so he’s going to take Owens’. Sami Zayn then comes out, and Owens looks incredulous. Zayn appears happy to be on SmackDown, but Corbin says no one cares. AJ Styles then heads to the ring. Aj says that this is not the Kevin Owens show, it’s SmackDown Live. It’s not about Zayn or Corbin either. 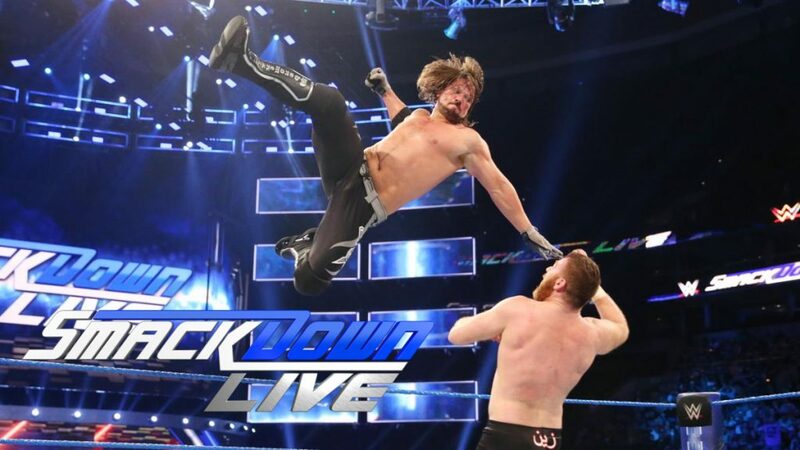 SmackDown is the house that AJ Styles built. Daniel Bryan then comes out to the stage. Bryan explains that Owens is scheduled to defend the US Title at Payback, and the winner of that match will be a permanent member of SmackDown. The winner will also face the winner of tonight’s number one contender match featuring Zayn, Corbin, and Styles. This wasn’t really much of a match. It was completely one-sided, then Bray Wyatt appeared on the Tron to cause a distraction which led to the finish. It didn’t do a lot for the ongoing story either. It felt like kind of a place-holder. Really good match. The action was almost non-stop, and it was hard to predict what would happen next. There was good teamwork shown by both teams, and both teams worked very well with each other. It was kind of short, but it was a very fun and entertaining title match. After the match, the Shining Stars appear and attack American Alpha. They toss Jordan into the barricade and hit Gable with a tandem powerbomb and back stabber. An okay match, but I’m just not a fan of Mojo. I feel like he sells weird, but maybe that’s just the hype gimmick. I didn’t care for this, even with (or partly because of) the shenanigans that Rob Gronkowski added. Shane McMahon heads to the ring. He’s here to talk about the state of the SmackDown women’s division, so he invites the entire division to the ring. Naomi, Natalya, Carmella (with James Ellsworth), and Becky Lynch all make their way to the ring. Shane congratulates Naomi on her recent title victory, but Ellsworth says Naomi is a horrible champ. Naomi makes Ellsworth flinch before hading the mic back to Shane. Shane then introduces the newest member of the SmackDown women’s division, Tamina. He then introduces the next newest member of the division, Charlotte. Sin Cara and Rusev are also headed to SmackDown. Aiden English is bereft of any company, so the spotlight is now only on him. He starts to sing his own praises (literally) when Tye Dillinger interrupts. Pretty good match. English was the more dominant of the two after the match really got underway, but this still felt like a Dillinger match. A highlight video of AJ Styles, the man who refused to leave SmackDown. Lana dances on a chair in a promo for her apparent solo SmackDown debut. Dolph Ziggler says the question on everyone’s mind is where Ziggler will end up in the Superstar Shakeup. He says he’s not going anywhere. He points out that the newness of the debuting superstars will eventually go away, but he’ll still be here doing what he does best. That’s when Shinsuke Nakamura heads to the ring. Ziggler asks Nakamura who he thinks he is. The crowd answers for him. After a bit of staring at each other, Ziggler hands Nakamura the mic. Nakamura introduces himself, and Ziggler looks less than impressed. Ziggler goes for a superkick but gets dumped to the mat. Ziggler backs away out of the ring. A highlight package for Baron Corbin. He takes what he wants, and he doesn’t give a damn. New Day is also heading to SmackDown. A highlight package for Sami Zayn. It’s been a long road. TJ Perkins says he’s glad he dumped the dead weight of Austin Aries. Great match. All three guys worked very well together. There was a good mix of speed, flying, and herd-hitting moves. There were great sequences where all three men were involved at the same time without the match breaking down into one-on-ones. This was a highly entertaining match and easily the best of the week so far. This was an entertaining show, and the tag match and triple threat made this a much better wrestling show than RAW last night. I think the Superstar Shakeup for SmackDown was about equal to RAW’s lack of any real excitement, but some of the new matchups will be interesting. Great match. I’ll watch this one again for sure.